There's nothing more obnoxious than getting something tiny stuck in your eye and desperately trying to flush it out. Even a speck of dirt is enough to render you temporarily blind (or at least teary-eyed for a while). 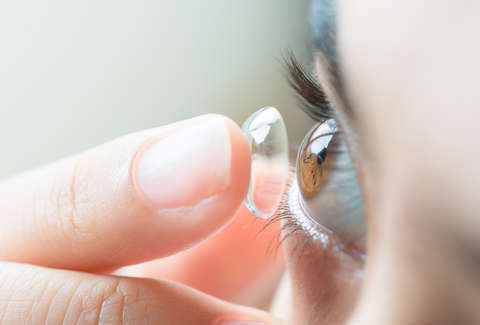 So, imagine having something the size of a dime stuck in there for nearly three decades without even realizing it, like one woman in the UK, who only recently discovered that she's had a contact lens lodged in her eyelid for a whopping 28 years. After complaining of a droopy eyelid for about six months, a 42-year-old unnamed woman recently visited an ophthalmologist to figure out what was going on. The doctor examined the area and found that there was indeed a lump under the lid skin, which an MRI later identified as a "well-defined" cyst. However, once they went in to surgically remove it, the cyst burst to reveal an old, hard contact lens, per a report on the case published last week in the journal BMJ Case Reports. Astoundingly, the woman never noticed the foreign object, and it evidently only started to cause problems recently having sat there chilling asymptomatically for two-thirds of her life. The woman isn't entirely sure how it got there, either, but her mom recalled that it may have happened when she got hit with a shuttlecock during a game of badminton when she was 14 and lost her contact lens (she never wore them again after that). And while it's kind of weird to think you wouldn't notice a big ol' contact lounging in your eyelid for so long, at least she wasn't hiding 27 of them in there. Let this just serve as a helpful reminder that keeping your dailies in for longer than advised is a bad idea. You could end up with a droopy eye decades later, or worse -- in a medical journal.